Please join us for informal parent workshops offered to help with a variety of “hot topics” faced by parents and students today. Feel free to bring your lunch or just come listen and learn. Each session will last one hour and will be held in the PAC (Black Box Theatre). The Third Thursday workshops are free of charge and are all scheduled from 12-1 p.m. Learn how to create interactive flashcards to help your child become an independent learner and study effectively for vocabulary across the curriculum. Also, learn techniques to help your child retain new information quickly and learn fun ways to make it stick! Gain strategies to help at home and school. Learn ways to get your child organized and become more self-sufficient, leading to independence in academics and life. Learn ways to keep yourself and your family safe. Self defense is your first defense! Our own JA Resource Officer will give tips and insight into how to keep your “person” on the safest side! Gain insight into the difference between the two tests, the nuts and bolts of how to prepare effectively, required scores for college, and scholarship opportunities. What does it really mean and what can be done to re-mediate. You will gain understanding of the uniqueness and complexity of the dyslexic brain. Learn ways to help your child maximize his or her potential throughout school and life. Learn the nuts and bolts of early reading skills and how to strengthen your youngest readers. Brain based techniques and ways to enhance your child’s ability to read and spell effectively will be shared in this workshop. Space is limited. 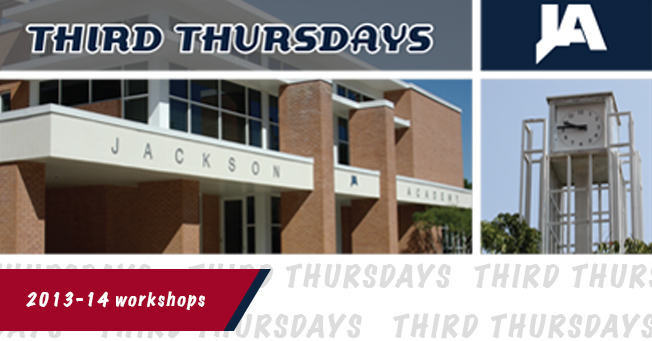 For more information and to R.S.V.P., contact Beth Murray-Wilson at bmurray@jacksonacademy.org.